From Bungalow on the Beach, I wanted to go on both North towards Poompuhar & South towards Karaikal which were filled with so so so many ancient temples!!! I hired a car and set out. Of all the places I saw, the most important 3 were Pallavaneeshwaram Excavations, Ponsei Temple and Valampura Nathar Temple. I’ll cover Ponsei and Valampura Nathar in another post, coz they were so awesome. Here’s a gist of the other temples, beginning with Akkur. 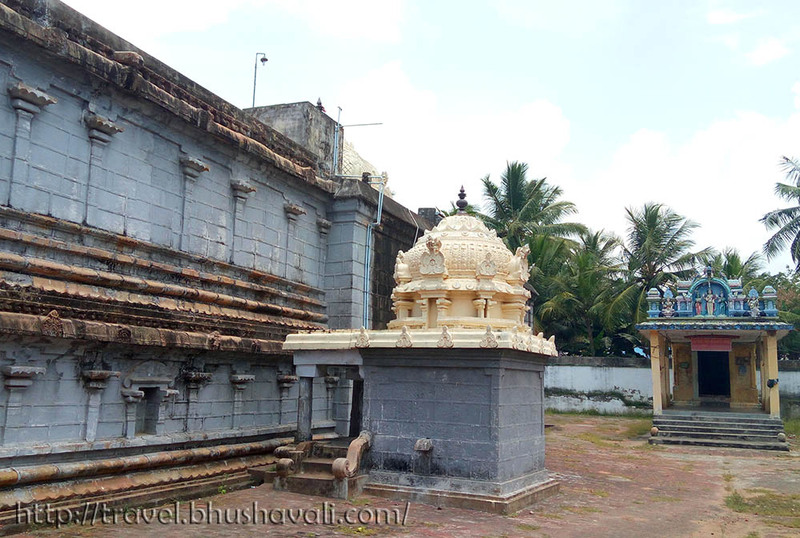 Lord Shiva here is called Thanthondrishwara or Suyambunathar and his consort here is Kadaganethri or Val Nedunkanni. The temple has hymns sung by both Appar and Sambandhar. It’s a Maada Koil, meaning it’s in a higher altitude and has a flight of stairs to reach it. The main section is white washed which even covers the inscriptions here. 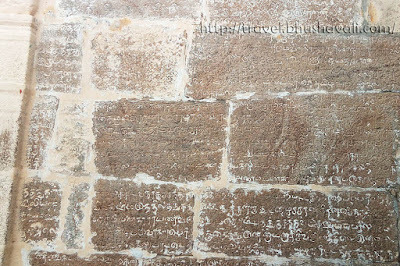 The inscriptions are of Rajendra Chola II and Kopperunchinga Pallava. From there, my next stop was Sembanarkoil. 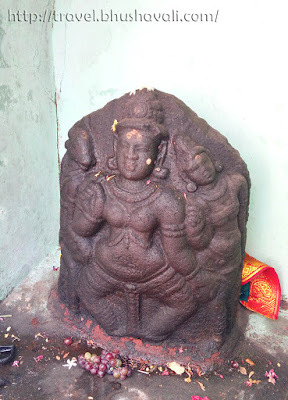 The Lord Shiva here is Swarnapuriswarar and His consort is Maruvarkuzhali or Sugundhakundhalambikai. The temple has lost it old charm. The inscriptions in the outer wall had been whitewashed and someone had realized its importance and has scratched it off! It is surrounded by concrete shrines in which the ancient idols are preserved. A relief sculpture in one of the shrines shows the king in devotion with a saint and minister! The stand-alone sculptures of Saptamatrika and Jyesta Devi are just stunning! 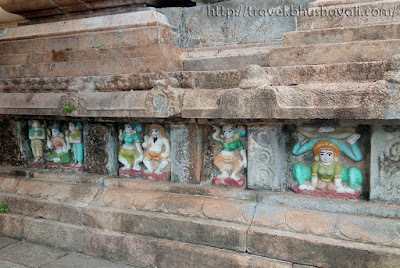 With the presence of these 2 (one of the oldest forms of worship in Hinduism), it is presumed to be built by Aditya Chola I. 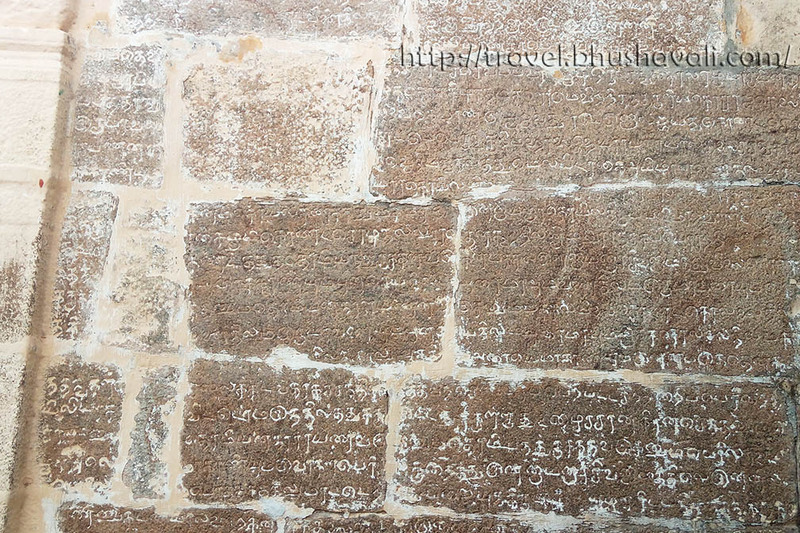 There are 6 inscriptions here of Chola Dynasty belonging to Kulothunga Chola, Rajathiraja Chola and King Sarfoji. Our next stop was Ponsei, followed by Thirukadaimudi Mahadevar Temple. 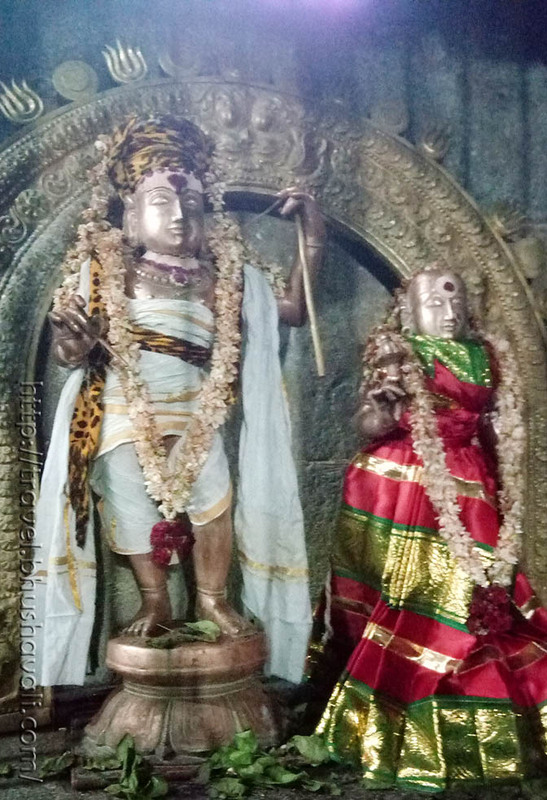 The Lord Shiva here is Kadaimudinathar or Annisamrakshaneeswarar and His consort is Abhirami. It’s a smaller temple and the whole ground has been paved with cement, enclosed in concrete walls and iron grills. Next was the Pallavaneeswaram Excavations. For anyone who knows about Tamil History, would know of Silappadhikaram. 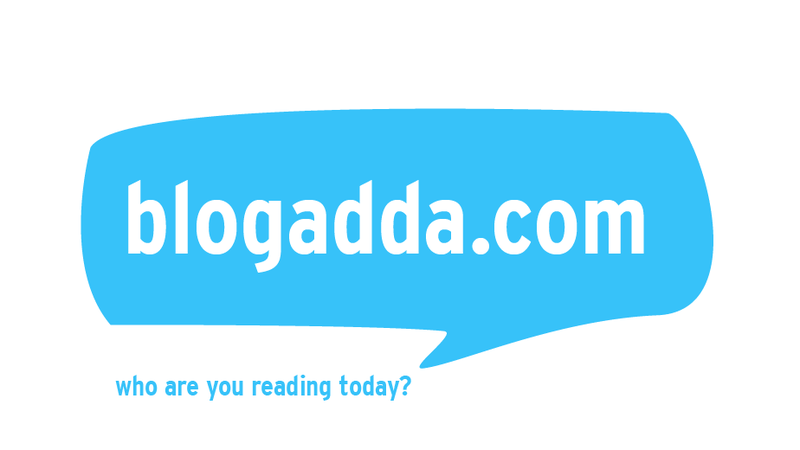 It’s one of the 5 Great Tamil Epics written by Ilango Adigal in 2nd-3rd C CE, where all the main characters where Buddhists and the setting is in Poompuhar. However today, Buddhism and Poompuhar don’t really match and I’ve always wondered about the ancient Tamil Buddists! 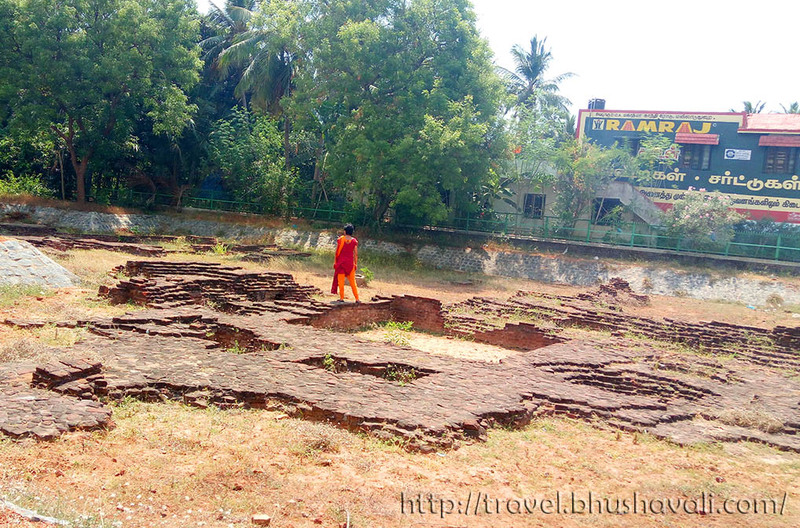 Recent excavation in Poompuhar has revealed a Buddha Vihara in ruins! It’s maintained by Archaeological Survey of India. Our next stop was Pallavaneeswara Swamy Temple. The Lord Shiva here is Pallavaneeswarar and His consort is Sowndaranayaki. Sambandhar has sung hymns here! We stopped next at Chayavaneswarar Temple. The Lord Shiva here is Chayavaneshwarar and His consort is Kuyilinum Nanmozhiyammai. This place has been mentioned in the Agananuru as well!!! Just behind this temple is the temple of the village diety of Sampathiamman! She is one of the oldest dieties of Tamil culture. Its more of a village diety than a properly maintained temples. Though the original temple is one of the oldest, the current sculpture is probably just a couple centuries old. 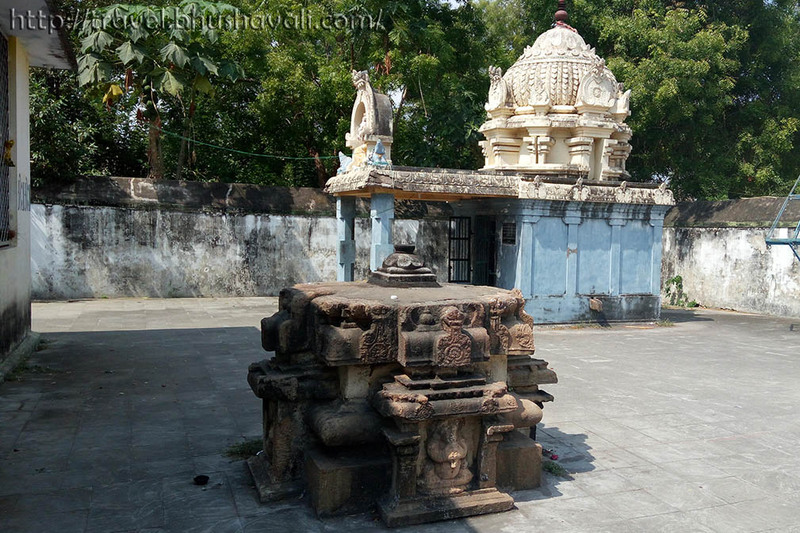 Next was the Valampura Nathar temple. Our morning section ended with Thalachankadu. Sambandhar has sung hymn on this temple. The Lord Shiva here is Sankaaranyeswarar and His consort is Soundaranayaki. For the evening section, we went southwards and began with Thiruvettakudy. I could have just shed my tears in this temple. It has totally lost its old beauty and architecture. The entire temple is new and the whole of interiors is paved with tiles!!! Even the friezes of relief sculptures were painted upon!!! The bronzes here were stunning esp of Lord Shiva and Parvathi as hunters!!! Next stop was Karai Koilpatthu and it was just a stunning huge temple! The sheer size of it and the number of sculptures inside were so many! It has a tall Gopuram. The Lord Shiva here is Parvathiswarar or Sameevaneswarar and His consort is Suyamvara Thapaswini. The main bronze sculpture is of Lord Shiva as a hunter (Kiraadhamurthy). The other bronzes incl Somaskandar were also gorgeous! We completed the day with Karaikal Ammaiyar Temple. This is a new temple built in 1929. Her legend is so extraordinary in Saivaite tradition (Lord Shiva Himself called her Ammai, which means Mother) that there would be a bronze of her in many temples. 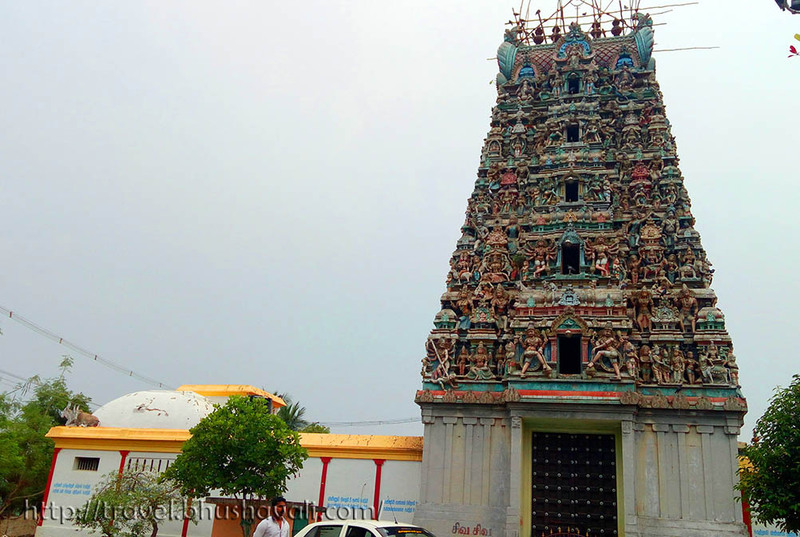 Realizing that there's no dedicated temple to Karaikal Ammaiyar in her own town, this was built! P.S.1: All temples mentioned in this post (except Pallavaneeswaram Excavation, Sampathiamman temple & Karaikal Ammayar Temple) are பாடல் பெற்ற ஸ்தலம் (paadal petra sthalam) meaning, has hymns sung on them atleast one of the 4 Saivaite Saints called Nalvar (Appar, Sundarar, Manikkavasagar, Thirungyana Sambandar). 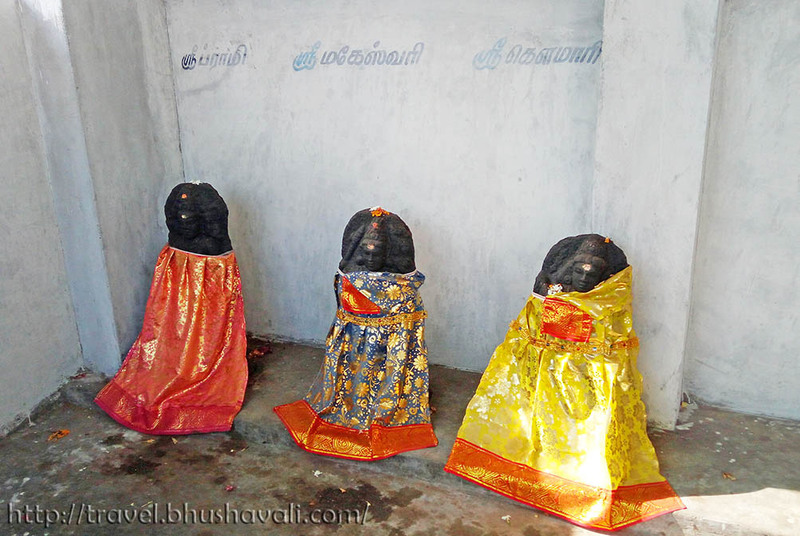 They were religious (specifically Lord Shiva) Tamil poets who lived in 6th to 9th C CE. Hymns sung by them on these temples are proof of existence of these temples since then!!! P.S.2: At Karaikal, don't forget to try out the Paruthi Paal Halwa at Nagoor Alwa Kadai! Paruthi Paal is the milk of Cotton Seeds! Its a local delicacy and its yummm!!! I love traveling to anything historic. 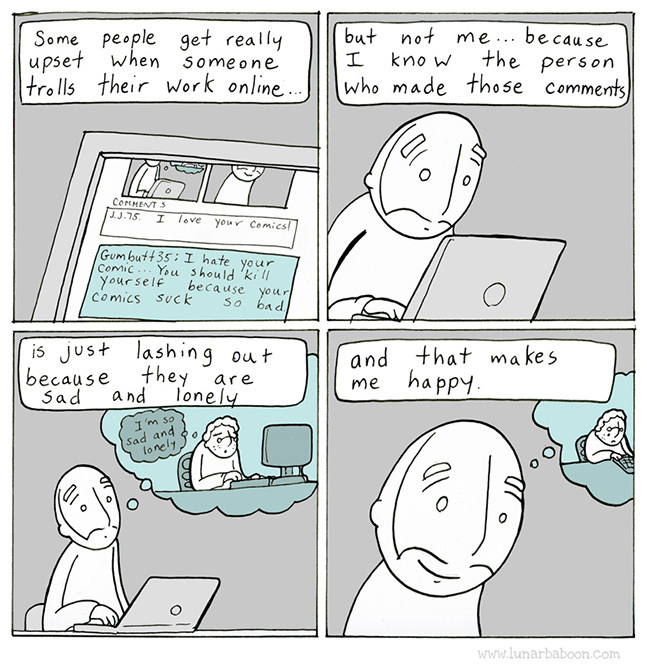 I have following your post. I can't get enough of how lovely the temples are. I look forward to your next post! Wow, some of these buildings are so amazingly detailed. I would love to see them in person! What a deep history! I LOVE old temples like these. The detail and architecture gets me every time! It's incredible how well preserved everything is too. And love that it doesn't look super touristy! South India always seems so different to North India. Maybe it seems more mysterious or less explored. It's sad that some of the temples you visited have been badly renovated rather than properly restored. I had never heard of Poompuhar. What charmed me in this post is the village diety of Sampathiamman! She looks so different from the statues of Hindu deities. I wonder what the story behind it is. That is a lot of historic temples covered in a trip. Love reading about the stories and legends attached to these temples. You've visited so many fascinating temples! The bronze sculptures look especially impressive. It is nice to learn what they represent and the history of the temples! I love all the temples, it's impressive to look at all small details and learn about the history behind it. We recently went to Cambodia and we did 3 days Temple tour and I feel it wasn't enough. Maybe one day I can get to visit these temples as well. Thanks for sharing. I love visiting temples (well any religious edifice really). I loved your post! Those temples looks beautiful ! Pallavaneeswaram Excavations is my favourite! Cant wait to visit India one day and explore all of it ! Your photos are amazing! I really love reading about temples and those look so beautiful. Can't wait to go to India in the future to experience those beauties. 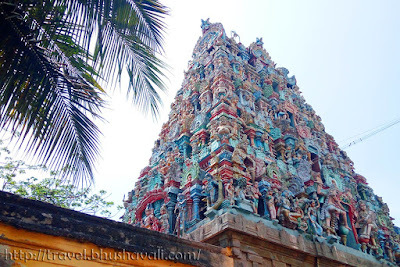 Love the colourful South Indian temples...they are so unique. You have share places that I know nothing about, even though I am from India, and I am now intrigued to get here!Love what all goes on inside the temples as well...the buzz and the fragrances add to the experience. Such an interesting place to visit! Would love to visit this too! I have been practicing buddhism for just over a year, I find it fascinating to see old temples and artifacts from this ancient religion. I would love to visit somewhere like this someday. This is my first time hearing of this amazing destination. The Pallavaneeswara Swamy Temple looks very similar to one of my favorites from Singapore. Loved hearing the ancient history behind the ornate buildings. I didn't even know a bit about these temples of South. All of these looks equally fascinating and so different. 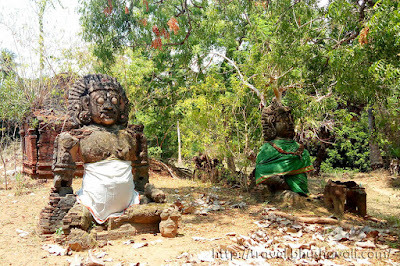 But it is sad to know that these temples and sites are not well maintained. The inscriptions on the walls aren't allowed to be touched, right? Guides usually say that when touched with human heat, it will deteriorate and be destroyed through time. Great to see some color in that swamy temple. Being a history buff, I also enjoy visiting temples and old places myself, but maybe not several days in a row. Hehe. These look quite intriguing. I love the way you have shared the contact numbers to make things easy for enthusiasts like me :D Next long weekend! You did an amazing tour and report of those ancient temples. I can't belief the colors are still bright and rich centuries later! The Pallavaneeswara Swamy temple is stunning and so colorful, I'd love to photograph it. Those Pallavaneeswaram excavations look fascinating too, it's hard to imagine how it used to be and the history there. Beautiful those temples! And I also love to discover all the history and cultural anecdotes behind those ancient monuments! I don`t think I`ve been to these types of temples. It would be so interesting to learn more about the history and facts of these places. The colorful temple would be very impressive to see in person. The attention to detail in incredible. I can only imagine how long it would take ancient cultures to create this. Will you be travelling lesser now that you're getting bigger? Hope to see more updates about your new identity soon!